But the reality is that executive actions like these are an indication of presidential weakness – not dictatorial power. The fact is that one of the great frustrations of Obama’s presidency – a frustration he has expressed on more than one occasion – has been his inability to get Congress to pass more stringent gun control legislation. In response, Obama has decided to move ahead on his own, in this instance by taking executive action to broaden the definition of what it means to be a gun seller. Under existing law, those purchasing guns from licensed gun dealers must undergo a background check. Those acquiring guns privately, in contrast, do not. By broadening the definition of who is a “gun dealer”, then, Obama’s executive action will in theory expand the number of background checks. However, while it is true that Obama is, in effect, “making law” unilaterally, the substantive impact of his actions on gun violence is likely to be small, something he concedes. Indeed, in the run up to his announcement, gun sales have soared to levels not seen in two decades. The broader point, however, is that taking executive action, as opposed to legislating, is not a very effective way to make substantive, lasting policy change. This is a point that political pundits, and even some political scientists, frequently overlook. There are several reasons for this. To begin, executive actions have much more limited scope than legislation – presidents can’t use them to overturn existing law. Nor can they be used on actions that require spending money without appropriations by Congress. In the case of background checks, Obama can order executive agencies to redouble their efforts to expand background checks, but he can’t unilaterally appropriate more money to implement his order. The bigger problem when it when it comes to making law via executive action, however, is that the outcome is often short-lived, a point Donald Trump drove home in his interview with John Dickerson on Face the Nation on Sunday. When asked about Obama’s proposed action, Trump replied, “Well, I will say this. There’s lot of precedent, based on what he’s doing. Now, some have been — his executive order on the border, amazingly, the courts actually took that back a step and did something that was very surprising, which is, they did the right thing, so that maybe that one — but I would be rescinding a lot of executive orders that he’s done (italics added).” Trump’s threat to rescind Obama’s executive action is not to be taken lightly. In forthcoming research Jesse Gubb and I have conducted, we have found that of the roughly 300 most substantively important executive orders (EO’s) issued during the period 1947-2003, only about half are still on the books today. About 30% have been revoked by a subsequent president and another 2% overturned by congressional legislation. Because of the censored nature of the data, this probably understates how many EO’s have been actually revoked. Beyond the lack of durability, however, executive orders illustrate a more general weakness of relying on what presidential scholar Richard Neustadt describes as a president’s “command” authority: it indicates a failure to bargain effectively with Congress. Trump drove this point home in his interview, noting that, “It’s supposed to be you get along with Congress, and you cajole, and you go back and forth, and everybody gets in a room and we end up with deals. And there’s compromise on lots of other things, but you end up with deals. Here’s a guy just goes — he’s given up on the process and he just goes and signs executive orders on everything.” Without trying to apportion blame, or even to accept Trump’s characterization that Obama has “given up” on the legislative process, the plain fact is that the President and Congress have not engaged successfully in the process of bargaining that is at the heart of the legislative process. There is a more fundamental risk in Obama’s approach, however, beyond the failure to secure a desired legislative outcome. It is that efforts to achieve goals unilaterally are likely to stiffen congressional resistance to future presidential efforts to secure preferred legislation in other areas. In his famous study of the presidency, Neustadt noted that when it comes to evaluating presidents, “Strategically, the question is not how he masters Congress in a peculiar instance, but what he does to boost his mastery in an particular instance, looking forward tomorrow from today.” We have seen other instances, most notably in his efforts to expand legal protection to children who came to this country illegally, where Obama’s efforts to act unilaterally have embroiled him in legal controversy and perhaps stiffen congressional opposition to his objectives. For all these reasons, unilateral executive action is a poor substitute for bargaining with Congress and is best understood not as a sign of an imperial presidency who can “make law with the stroke of a pen” but rather as evidence of a president’s inability to bargain successfully with the legislative branch. Speaking more generally about presidents’ efforts to achieve goals via “command” authority, Neustadt concludes that, “Not only are these ‘last’ resorts less than conclusive, but they are also costly. Even though order is assured of execution, drastic action rarely comes at bargain rates. It can be costly to the aims in whose defense it is employed. It can be costly, also, to objectives far afield.” One can understand Obama’s frustration with Congress’ unwillingness to enact more stringent gun control via universal background checks. It may be that in issuing this latest executive action, Obama will make the issue of gun control more salient to the public, thus increasing pressure on Congress to act legislatively. But I suspect it is more likely that this latest action will harden opposition in Congress to further gun control legislation and that any real progress on this front will have to wait until a new President and Congress take office. If so, Obama will not be the first president to confront the difficulty of trying to make policy unilaterally in a constitutional system of shared powers. Unfortunately, he is also not likely to be the last. Senator Obama – Meet The Big Man: President Obama! “The notion that as a consequence of that authorization, the president can continue down a failed path without any constraints from Congress whatsoever is wrong and is not warranted by our Constitution,” – Remarks in 2007 by Senator and presidential candidate Barack Obama criticizing President Bush’s decision to increase U.S. military forces in Iraq based on a 2001 congressional authorization. If we gauge a president’s success by his ability to achieve campaign promises, there is no doubt that in foreign policy President Obama has fallen far short of the mark. As research by Middlebury College student Danny Zhang of presidential candidate Obama’s public remarks reminds us, Obama’s foreign policy agenda included two fundamental tenets: he would wind down U.S. military involvement in Iraq, and he would return to a more collaborative and bipartisanship conduct of foreign affairs – one more nearly in accord with the Constitution. Arguably neither tenet has been met. It is now clear that Obama will almost certainly bequeath to his successor an anti-terror military campaign in Iraq and Syria intended to destroy the Islamic State (IS) that even the most optimistic projections suggest will last years, and with uncertain odds of success. And rather than consult with Congress, Obama has justified his current air campaign against IS on the Bush-era 2001 authorization by Congress to use military force against terrorists who attacked the United States – the very premise he rejected on the presidential campaign trail while a U.S. Senator. It is tempting to conclude from this record that candidate Obama was naive, if not duplicitous. But I have no doubt that he sincerely believed his rhetoric – as did most of those who voted for him. He likely did believe that, as he indicated to the Boston Globe “[t]he President does not have power under the Constitution to unilaterally authorize a military attack in a situation that does not involve stopping an actual or imminent threat to the nation.” As I have often said, however, governing is far different than campaigning. The reason why President Obama’s foreign policy seems to have largely followed his predecessor’s blueprint is because the nature of the strategic threats to the United States has not changed across the two presidencies. Nor has the president’s constitutionally-based responsibility to protect the nation from attack. That combination of similar threats and a shared vantage point made it almost certain that President Obama’s foreign policy would not deviate markedly from George W. Bush’s – a point some of us have made before. Whatever the explanation, the reality now is that the U.S. is once again engaged in a military conflict in Iraq and Syria of indeterminate length and uncertain success. And, like his predecessor’s Iraqi war effort, Obama is trying to create an international “coalition of the willing” to help defeat IS. To date, however, the largely U.S.-led campaign of targeted air strikes has not appeared to have had much success in rolling back IS’s territorial gains. That leaves open the possibility that at some point the U.S. may have to increase its troop commitment beyond the nearly 2,000 now stationed in Iraq if Obama’s war aims are to be reached – a troop increase that many military experts suggest is inevitable. Nor has President Obama appeared to heed candidate Obama’s advice, as exemplified in the opening quote to this piece, to conduct foreign policy in a more collaborative, bipartisan and constitutionally-acceptable manner. In fact, as noted above, Obama has cited the Bush-era authorization of military force as the legal basis for the current bombing campaign against IS. Critics contend that this smacks of presidential imperialism. In truth, however, Obama’s actions are consistent with those of his predecessors’, almost all of whom have sought to protect the presidency’s ability to fulfill its constitutional prerogative to defend the nation from attack. As Madison argues in Federalist 51, this effort to defend the presidency as an institution is both expected and desirable: “But the great security against a gradual concentration of the several powers in the same department, consists in giving to those who administer each department the necessary constitutional means and personal motives to resist encroachments of the others. The provision for defense must in this, as in all other cases, be made commensurate to the danger of attack. Ambition must be made to counteract ambition. The interest of the man must be connected with the constitutional rights of the place.” Under Madison’s reasoning, it is Congress’ role to push back against this assertion by Obama of prerogative power. However, as I noted in this previous post, many congressional Republicans are applauding Obama’s newfound militarism while most Democrats do not want to take on their own president heading into a midterm election. We should not be surprised, then, that as President, Obama more closely resembles President George W. Bush than he does Senator or candidate Obama. In the modern era, the United States – as the sole superpower – no longer has the luxury of choosing whether to take the lead in foreign affairs. That is a burden that cannot be removed, no matter how much Americans may yearn for – and candidates may promise – a return to normalcy. And the President, as the embodiment of national sovereignty, simply cannot delegate this leadership role to any other political actor. Senator Obama – meet the big man: President Obama. Is Obama’s Leadership Style To Blame For His Foreign Policy Problems? It has not been a very good month for President Obama when it comes to foreign policy. Despite his personal entreaties to Russian President Vladimir Putin to stay out of the Ukrainian civil conflict, photos released today by American intelligence sources indicate the Russian military is firing artillery from Russian soil on behalf of the Ukrainian separatists. This comes on the heels of the shootdown, allegedly by those same separatists using a Russian surface-to-air missile, of a Malaysian civilian airliner that killed 298 people. Meanwhile, Obama’s Secretary of State John Kerry has had no success in brokering a lasting truce between Israel and Hamas in the Gaza strip, where the Israeli invasion, about to enter its third week, has led to the deaths of at least 1,000 Palestinians, most of them civilians, in addition to the more than 40 Israeli fatalities. While these two crises dominate the headlines for now, other foreign policy trouble spots continue to fester. In Syria, the civil war enters its fourth year and has cost more than 170,000 lives with no sign that the increasingly fractious U.S.-backed rebels will be able to overthrow the Syrian leader Bashar Assad without direct U.S. military intervention – which Obama so far has resisted. In Iraq, on the heels of the U.S. military withdrawal, unexpected territorial gains by the al Qaeda splinter group Islamic State in Iraq threaten to split that country into three partitions and, possibly, ignite another sectarian conflict. In Libya, less than three years after Obama helped depose dictator Muammar Gaddafi via a multi-nation military intervention, rival militias fight for power amid a deteriorating security situation and in the absence of any real civil authority. And in Afghanistan, where Obama’s three-year military surge recently wound down, there are growing doubts regarding whether the American-trained Afghan forces can beat back a Taliban resurgence, even as political infighting threatens to break apart the fragile civilian government. Not surprisingly, conservative critics blame Obama for what they believe to be his failed leadership style which they argue has contributed to his inability to effectively address any of these foreign policy crises. Charles Krauthammer berates the “vacant presidency”, arguing that Obama’s “detachment — the rote, impassive voice — borders on dissociation.” A.B Stoddard, in urging Obama to “act presidential” writes, “He could acknowledge that Americans find it comforting and appropriate for their president to be present in a crisis, let alone during many at once, and not simply speaking to a bank of cameras stationed outside some incongruous setting.” Even Obama’s supporters wonder whether he can rescue his “sputtering” presidency, while more neutral observers debate whether he has achieved lame-duck status with unusual rapidity. In assessing these criticisms, one is struck by how the adjectives used to criticize Obama’s leadership style now reference the very same traits that supporters praised on the eve of his election in 2008. Five years ago Obama was viewed as “pragmatic” – but now he lacks guiding principles. Then supporters praised his thoughtfulness – now he is passive. “Patient” has become “reactive”. At the same time polls suggest attitudes are softening a bit toward Obama’s predecessor George W. Bush, who not so long ago left office criticized for his rash (proactive? ), impetuous (decisive?) leadership style. The real lesson to be gleaned from these shifting standards of evaluation is not that the pundits are fickle, or that the public does not know what it wants in terms of leadership style. It is that the foreign policy problems presidents confront are often inherently intractable, with no cost-free solution available. Bush invaded Iraq, successfully overthrew a dictator, and yet that decision set in motion a train of events that has led to the current crisis there. (I leave it to partisans to debate how much Obama’s failure to maintain a military presence in Iraq contributed to the current state of affairs.) On the other hand, Obama has refused to intervene in Syria, and the situation there is no less dire. In Libya, Obama chose not to go it alone and instead to operate as part of a multinational force, but results are arguably no better. In Afghanistan, he initially doubled down on Bush’s military intervention, and then largely withdrew U.S. military forces, and yet the long-run prospects for a stable government there remain grim. Yes, each of these situations is unique in important respects. Moreover, partisans on both sides can and will argue the merits of their preferred leader’s particular choices. But to the objective observer it often seems that presidents are damned if they do intervene, damned if they do not, and damned if they opt to do both. It is hard to see how changes in leadership styles, at least as characterized in the short-hand jargon of political pundits, has had much impact on presidents’ ability to effectively address any of these international crises. Instead, the lesson seems clear – a president’s ability to “solve” foreign policy crises has much less to do with his (someday her) personal leadership qualities, and everything to do with the nature of the crises themselves. When there are no good solutions, changing leadership styles is hardly likely to matter, despite what partisans critics on both sides of the political aisle would have us believe. As I noted, however, if we simply ask respondents to evaluate each president based on a fixed set of criteria, as in this Gallup poll, rather than comparing them in order to choose the best or worst, Obama fares much better. So question wording against the backdrop of recent partisan sorting is almost certainly what is driving the Quinnipiac result. It is the same phenomenon that, as I discussed here, makes these two presidents the most polarizing in recent history. As you can see, both Reagan and Clinton have seen their net approval ratings climb some 20 points from where they stood in polling that occurred during their presidencies. That climb, I suggested in my last post, largely reflects the public’s growing appreciation of the sustained economic growth during their respective presidencies. Note that Nixon, Carter and George W. Bush all have net negative ratings, while Kennedy’s (based on only two polls) and George H. W. Bush’s are consistently positive (along with Clinton and Reagan). Ford and Carter, meanwhile, straddle the break-even line. With the exception of Ford, note that none of these presidents’ net favorability ratings today are close to where they began when Gallup polled during their respective presidencies. Some of that fluctuation is driven by new stories that momentarily focus public attention on a particular president, but it also reflects more fundamental opinion change as the presidents’ historical record comes into focus. 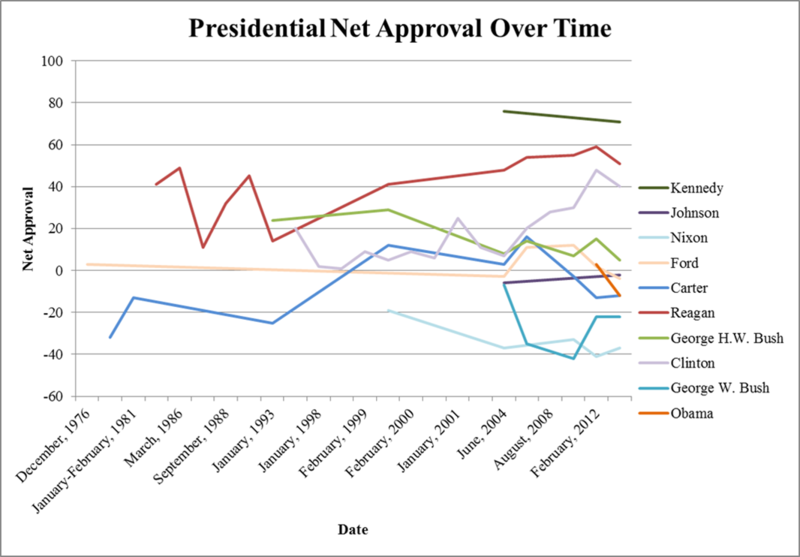 Given this, is it conceivable that Obama’s net favorability will mimic Reagan and Clinton’s positive trends? To date Gallup has included Obama in only two of these particular polling exercises, so it is too early to draw lasting conclusions regarding where he will end up. But if the unemployment levels continue to fall throughout the last two-plus years of his presidency against the backdrop of an accelerating economic recovery, I would not be surprised to see Obama move squarely back into the positive favorability range. At that point no one – not even the partisan pundits – will be paying much attention to the Quinnipiac poll. Is Obama the Worst President of the Modern Era? The results have received a great deal of play among pundits on the interwebs, so it is probably useful to put them in some perspective. To begin, the survey asks respondents to name the best and the worst among the dozen post-World War II presidents – it does not give respondents a chance to evaluate these presidents in an absolute sense by, for example, rating presidents on a scale from outstanding to below average, which is what Gallup does (more on Gallup below). So finding that Obama is the worst of the post-World War II lot doesn’t necessarily tell us what respondents think of him outside a comparative perspective. How bad is bad? Note also that 8% of respondents rate him as the best president in this era, which places him 4th in this category, behind only Reagan, Clinton (18%), and JFK (15%). Note also that Obama does better (less badly) among Democrats who are much more likely to cite G. W. Bush or Nixon as the worst president. Interestingly, there’s not much gap at all between men and women, with pluralities of both choosing Obama as the worst president among the 12. Moreover, that positive gap has been growing larger for both presidents since they were first included on Gallup’s survey asking the public to evaluate the most recent presidents. (I’ll show some data in my next post showing these trends.) Based on this question, Obama ranks 4th among presidents according to the net positive approval gap. One is tempted, of course, to dismiss any poll that rates Bill Clinton, one of only two presidents to be impeached, so favorably. Elsewhere I’ve discussed at length some of the difficulties with asking the public, and academics for that matter, to rate the presidents. Still, I wouldn’t dismiss the Quinnipiac or Gallup results entirely. Note that both Reagan and Clinton are remembered for presiding during a period of sustained economic growth. Indeed, some of Clinton’s highest approval ratings came during the Lewinsky impeachment proceedings, in part because the public placed much more importance on the state of the economy than they did the state of Clinton’s zipper. Fairly or not (and longtime readers know I think it is unfair), we tend to hold the president accountable for the state of the economy as it is (and not how it might have been under different circumstances). This is particularly true as one becomes increasingly invested in the economy. In the Quinnipiac poll, fully 45% of respondents cited the economy, jobs or the budget as the most important issue facing the country, with another 6% citing health care costs. This is by far the most highly cited category. In contrast, only 3% cited “war” or “terrorism” and only 1% cited “class inequality”, “lack of religion”, or “family values”. Moreover, it is the older respondents who have the more negative view toward the economy which likely explains their more pessimistic attitude toward Obama’s performance. It bears repeating that the issues the pundits tell us matter (see the Hobby Lobby court decision!) don’t really resonate with most voters, particularly when it comes to evaluating presidential performance. As my students have heard me say repeatedly, the President more than any other elected official embodies national sovereignty. As such, his fate is closely intertwined with how the public views the state of the nation. To date, Obama has presided over a middling economic recovery, one characterized by incremental growth and sustained unemployment. Yes, Tim Geithner may be correct that in bailing out the banks and pushing a stimulus bill through Congress Obama averted a deeper economic calamity. But the fact remains that Americans are dissatisfied with the pace of economic growth during the Obama presidency and that dissatisfaction is largely responsible for the results of the Quinnipiac poll. Of course, as I’ve noted on many occasions, asking people to evaluate a president while he is in office is problematic. I suspect many respondents to the Quinnipiac poll put far more emphasis on the here and now when rating presidents rather than on past circumstances, such as the stagflation that characterized Carter’s presidency, for instance. We will be better positioned to see how Obama is rated only when the public gets some distance from his presidency. Unless those economic numbers improve dramatically, however, I suspect Obama will not be chosen by very many respondents as the best president in the modern era. In the end, when it comes to presidential evaluations or presidential elections, it remains the fundamentals, stupid.